These sets are produced in limited editions numbered and signed exemplars, so if you would like to become owner of one of these magnificent sets, e-mail us soon. 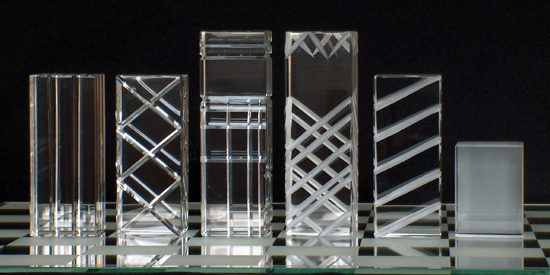 The designer Eva Starková, author of the famous Refraction chess set (shown bellow), created another chess masterpiece - the Inclined chess set. 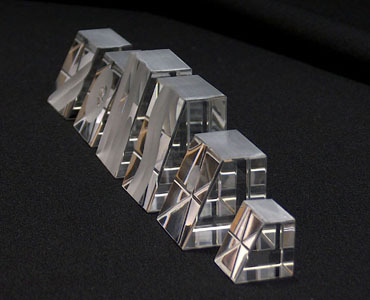 All pieces have a quadratic base and slanted front side, this shape breathes life into the crystal which reflects in various ways and creates extraordinary views from all sides. The figures are decorated with various hand carved cuts, made by master cutter Jiri Neuzil. 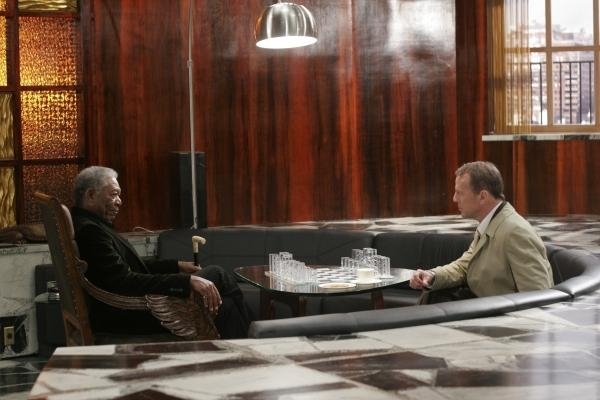 The black side is very clearly differentiated by matt tops. 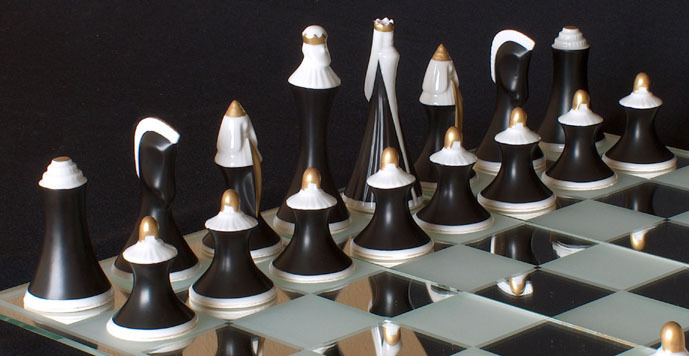 This wonderfull chess set will be produced in a limited series of 50 signed pieces. King size: 4cm(1.6") To inquire about pricing and further details, pleased e-mail us. 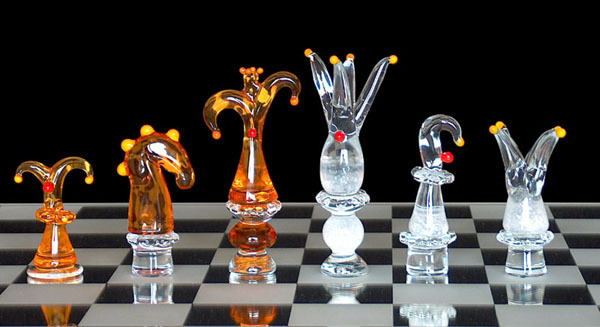 The beauty of crystal glass comes to life with this fully hand-crafted set, produced in limited quantity of 10 sets and designed by Eva Starková (Sasínková), who also designed the Quadrant crystal chess set. 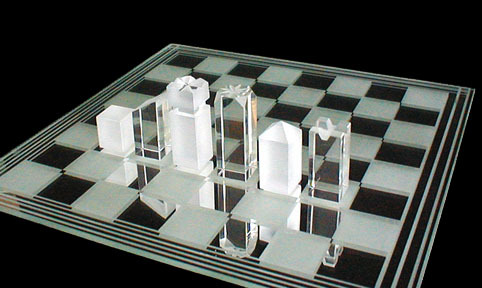 Thanks to its clarity, quadratic shape and board of black glass, the chess game will lighten up every space. For detailed description please consult these PDF files: Large (2MB), Small (0,5MB) or this page. For a look on how this set is being made just click here. Please e-mail us to enquire about pricing and availability. This fully hand crafted set is made in baroque style by master glass blower Vladimir Zubrican. 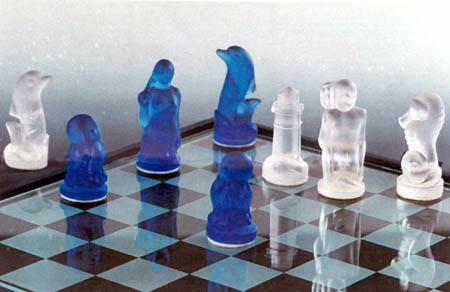 The king is 22,5cm (9") tall and you have your choice of any color for the bodies (here shown white and blue). Only 10 sets will be produce and each will come with a numbered and signed certificate and both kings. To inquire about pricing and further details, pleased e-mail us. For more detailed pictures click here. This set is fully hand crafted set by Eva Urbanova using the traditional lamp working technology. 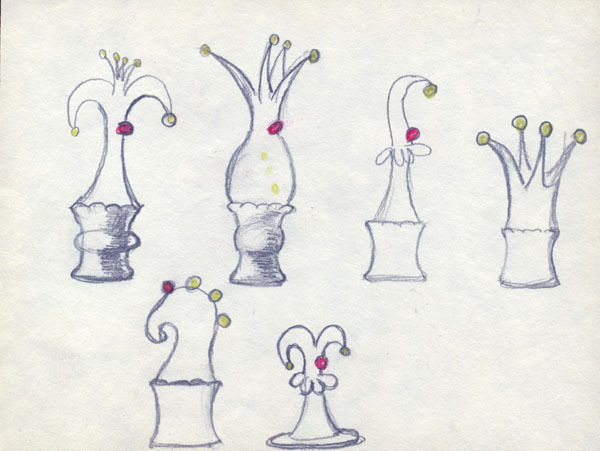 The king is 9,5cm (3.75") tall and you have your choice of any color for the bodies (here shown white and red). Only 50 will be produced and each will come with a numbered and signed certificate and both kings. To inquire about pricing and further details, please e-mail us. This is also a clown set, but very abstract, free flowing and simply beautiful. It is also made by Eva Urbanova na is for those of you who like modern art. 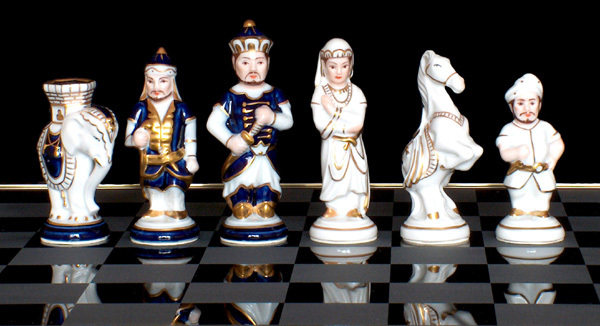 The king is 11cm (4.3") tall and you have your choice of any color for the bodies (here shown white and amber). Only 50 will be produced and each will come with a numbered and signed certificate and both kings. To inquire about pricing and further details, please e-mail us. 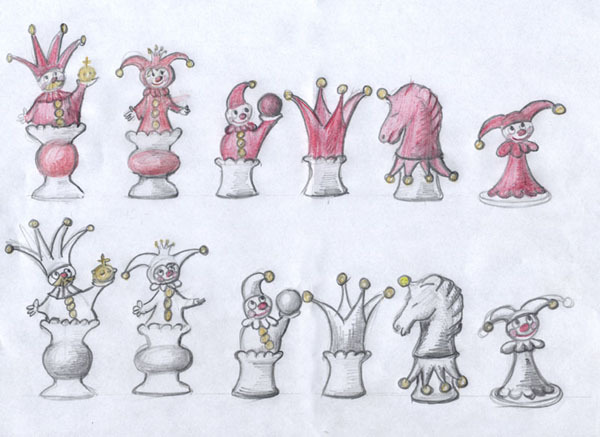 This huge clown set was developed and is made by Vladimir Zubrican, who is also the artist behind the Baroque set shown above. The king is 24cm (9.5") tall and you have your choice of any color for the bodies (here shown blue and red). 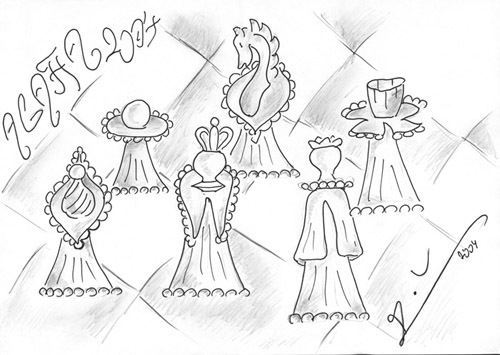 Only 10 will be produced and each will come with a numbered and signed certificate and both kings. To inquire about pricing and further details, please e-mail us. This set consisting of hand cut shiny and frosted quadrants was designed by Eva Sasinkova (author of Refraction set) and Jan Starka. Only 100 sets of this modern small set will be produced. For more details, please go to the catalogue page. This set was designed in the 1960's in the Royal Dux Porcelain Manufacture but was not produced for very long. We are proud to exclusivelly reintroduce this set to chess collectors world wide as we believe this beuatiful set should not be missing in any collection. The set has fairly simple but harmonius design and uses only white, matt black and matt gold finishes. 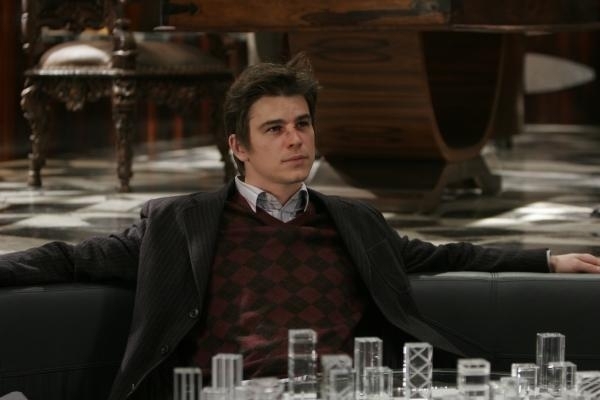 The king stands 10,5cm (4.1") tall, the pawn is 5cm (2"). The bases are approximatelly 4cm(1.6") in diameter. 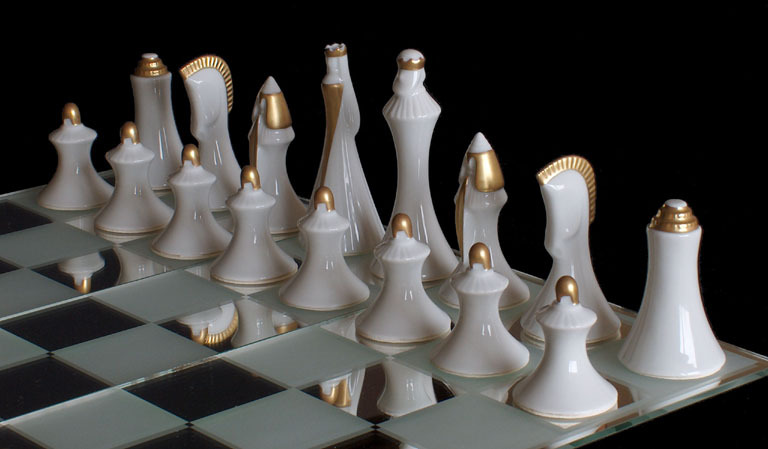 Fully hand painted porcelain set that has been pleasing chess collectors for many decades. Now you can also become a proud owner of this masterpiece. For more details, please go to the catalogue page. 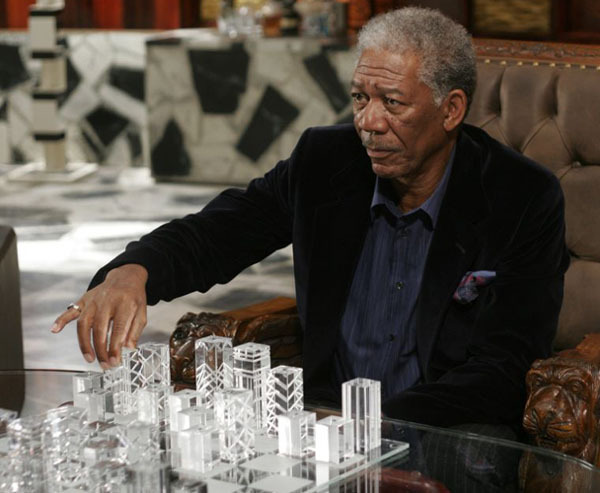 The pieces of the set are made by pressing hot colored glass into metal molds. This set is still being pressed into the original moulds created in the 1920's, which shows it's standing value. For more details, please go to the catalogue page. 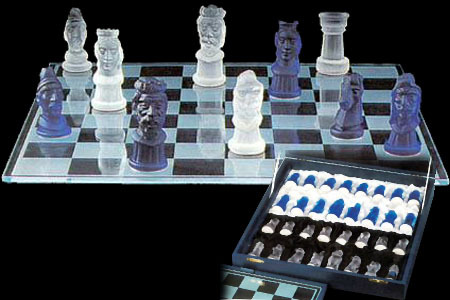 Slightly smaller and made into slightly younger moulds, this set makes an ideal complement to the Legend chess set. For more details, please go to the catalogue page.